Connectable, Break Resistant and Escape Proof! Illuminated Ant Farm! 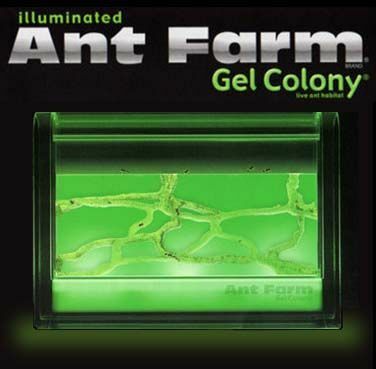 Gel Colony by Uncle Milton Description Just like the Uncle Milton’s Ant Farm Gel Colony, the Illuminated Gel Colony is filled with green translucent nutrient gel that provides the ants with everything they need to survive so there is no need to feed or water them. Not only is the maintenance easy with this product but the viewing is easier as well, thanks to the illuminator. The translucent gel allows you to have a 3D view of the intricate tunnels that the ants build and the illuminator makes these tunnels even more visible. Watch as ants dig 3-D tunnels in illuminated nutrient-rich gel. No feeding or watering needed! Connectable, Break Resistant and Escape Proof!